Latest JetNet managed ethernet switch for harsh industrial environments has built in cyber security features for securing the IIoT. Available from MAC Solutions, Korenix has launched a new Industrial Ethernet switch that is suitable for a wide range of industrial automation applications. The switch has IEEE 1588 compatibility for use in Real Time applications using industrial protocols such as Ethernet IP and ModBus. 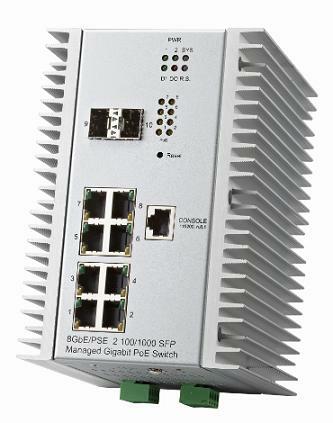 The new JetNet 7310G is a Layer 3 managed switch with Layer 2 network performance and provides 8 x 35W Power-over-Ethernet (PoE) ports, enabling the simple connection of devices such as PoE enabled I/O modules, GigE cameras, WiFi access points and other devices that require high power levels and industrial cybersecurity features. Like all Korenix products, the JetNet 7310G operates in the harshest of environments, with an operating temperature range of -40°C to +75°C and tolerates extreme EMC conditions, including rail trackside applications. With cybersecurity of OT (Operational Technology) now uppermost in automation engineers’ minds, Korenix and MAC Solutions are bringing enterprise-grade security features to industrial automation applications. By including a range of security features such as DHCP Snooping, Dynamic ARP Inspection Protection, IP Source Guard and Denial of Service Protection into a rugged, industrial-grade, Layer 3 Switch, the JetNet 7310G provides an easy route for engineers to secure their OT Networks. When combined with its Advanced Multiple Redundancy Architectures such as Rapid Super Rings and Dual Homing, the JetNet 7310G helps them quickly build a robust, secure solution. Ian Ritson, Business Development Manager at MAC Solutions comments: “The JetNet 7310G is specifically designed for harsh industrial automation applications, where high reliability, security and compatibility for use in real time applications are required. Due to this unique combination of built-in cybersecurity features and rugged, highly reliable design, we believe the JetNet 7310G is precisely what automation engineers require today,” adds Ritson. * IEEE 1588 PTP support (Precision Time Protocol for Real Time applications). * 8 x Full Gigabit PoE Ports @ up to 35W per Port for PoE enabled I/O modules. * 2 x Gigabit SFP Ports for Uplink. * 240W Total Power Budget. * Non-blocking high speed switch fabric. * Layer 2 Network Performance with Layer 3 Managed Switch functionality. * Compatible with Multiple Redundancy Architectures & Standards (ITU-T G.8032 ERPS, RSTP, MSTP, Super Chain). * Advanced Cyber Network Security – MAC security, IEEE 802.1x Port Based Access Control, IEEE 802.1x Radius Server Authentication, 802.1x MAB, Distributed Denial of Service, IP Source Guard, Denial of ARP Inspection. * Industrial-grade design switch (-40°C to +75°C operating temperature range with Redundant, wide range of power inputs).